This fall will be the 125th anniversary of one of the most famed unsolved crime cases in history and a story that continues to fascinate to this day. The Jack the Ripper case, also known as the Whitechapel Murders for the section of London where the killings occured in 1888, involved the gruesome homicides of (at least) five prostitutes by a still-unknown perpetrator. Much like today’s high-profile crimes, the case held Victorian London in a state of rapturous horror as an anxious police force, press and citizenry obsessed over the murders and hunt for the suspect. Graphic crime-scene photos, mysteriously cryptic letters and speculation on potential suspects – from butchers to surgeons to members of the British royal family – combine to make to make the lore of “Ripperology” a thing of modern legend. From a pretty early age, I had a macabre interest in Jack The Ripper. Aside from the countless true-crime books on the case, Jack The Ripper has made it to the big and small screen dozens of times over the years. I love the moody 1928 silent picture Pandora’s Box starring Louise Brooks as a wayward innocent who falls into a life of prostitution before becoming a victim of Jack. The 1979 movie Time After Time adds a sci-fi spin on the case with Malcolm McDowell as H.G. Wells chasing Jack The Ripper through time to modern day San Francisco. My favorite by far has to be the 1988 Golden Globe-winning TV miniseries Jack The Ripper with Michael Caine chewing the scenery as the real-life Scotland Yard chief investigator of the Whitechapel Murders Inspector Frederick Aberline. Made on the centennial of the case, the series focused on the theorized link of the murders to the British royal family and re-introduced the case to a new generation of Ripper-obsessives like myself. 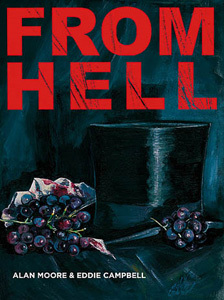 Of all the movies and books I’ve encountered about Jack the Ripper nothing can hold an oil lamp to Alan Moore and Eddie Campbell‘s 1999 graphic novel masterpiece, From Hell. Orginally released in a 10-issue serial and now available as a bound edition, From Hell is one of the most dizzyingly complex stories I’ve ever read. This is also Moore at his most obsessive with nearly 600 pages of slowly-building detail ultimately pointing to a grand and ancient conspiracy. The muddy black-and-white ink drawings of Campbell perfectly capture the grime of the streets of 19th-century London and the unhinged mind of a serial killer. The depth of research and detail in the characters and places surrounding the case really can’t be described, and it’s this complexity in the book that has driven me back to re-read it a number of times over the years. Johnny Depp starred in a 2011 film adaptaion of the story, but honestly I’ve never been able to bring myself to watch it given how much I love Moore and Campbell’s original series. A new book, The From Hell Companion, goes behind the scenes to the story and visual development of the book, and I’m certain I’ll be picking up a copy very soon. 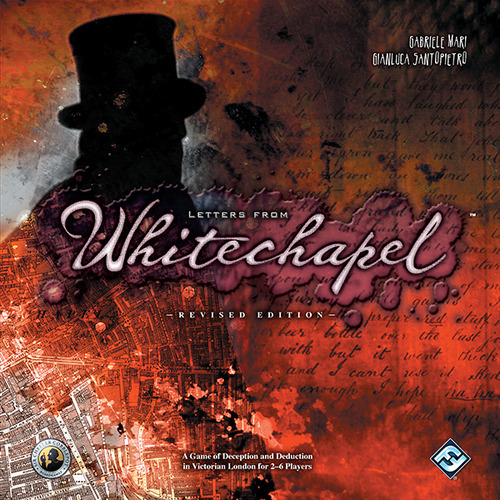 With a long-time interest with Jack The Ripper, I was thrilled to get a chance to play Fantasy Flight Game’s Letters From Whitechapel recently at Metropolitan Wargamers. The game presents a historically-accurate map of Whitechapel with its intricate cobblestoned streets and alleys on which a group of police officers attempt to track down and apprehend Jack The Ripper before his murderous spree comes to a bloody end. In the game, one player is elected to play as Jack while the other players take on the roles of patrolling London policemen. Behind a special screen, Jack denotes his hidden home base on a special sheet before placing tokens on the board at the location of possible victims. The police players then secretly place the starting locations of their patrolling officers. Then, all starting places for the police and prostitutes are revealed and markers are placed on the board. Going first, Jack then decides whether to kill his first victim or delay for time. Once the victim is murdered, a red token is placed to denote the scene of the crime and the police pawns are moved up to two black squares at a time. 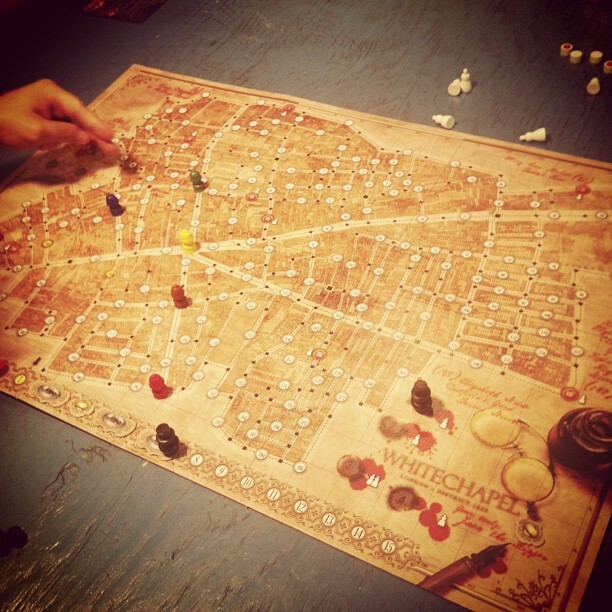 Jack the Ripper then moves each turn in secret between numbered spaces, marking the locations on his sheet away from view from the police players. A carriage token allows Jack to move two spaces and slip by police potentially blocking his path. An alley token lets jack slip through a dark back passage within any given city block. After each move by Jack, the police move and choose to investigate nearby areas or speculate on and adjacent location of Jack and make an arrest. If a player investigates a space where Jack has been, a clue is revealed and marked on the board. Turns alternate with Jack moving and the officers attempting to string together his movements through discovering more clues. Jack attempts to get back to his secret hideout before being found out by the inspectors within the set time of the round. If Jack is successful, the next round begins with a reset of the board and a new potential victim being placed. Letters from Whitechapel is basically a cat-and-mouse game with the police players attempting to decode Jack’s possible routes of movement in order to close in and capture him. In my first game, it took us two rounds to track down a very elusive Jack who ran devious circuitous routes back toward his hideout. After the first round, we felt fairly confident we had narrowed his home base to one of three areas of the board, and we finally caught him in the second round by focusing on those areas. The game involves a lot of discussion among the police players with various theories of Jack’s whereabouts bandied across the table throughout the game. For gamers with more than a little Jack The Ripper interest coupled with a desire to play out a game of hidden movement of the opponent, Letters From White Chapel is incredibly satisfying. With 125 years of the unsolved Whitechapel Murders behind us and probably many more to come, having a go at bringing Jack The Ripper to justice makes for an intriguing couple hours of play.